I had a problem with setting up Google Mail (Gmail account) in my iPhone, it works in few days then stop working. It works again then stop working all the time. And I get the error message: Cannot Get Mail. 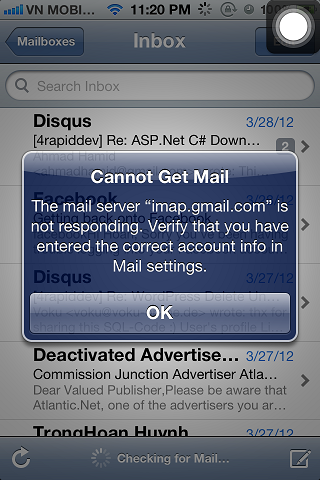 The mail server ‘imap.gmail.com’ is not responding. Verify that you have entered the correct account info in Mail settings. It’s so crazy because I don’t change anything include Google email account and the configuration settings. I even tried to delete my current Gmail account then create again and again but the issue is still there. 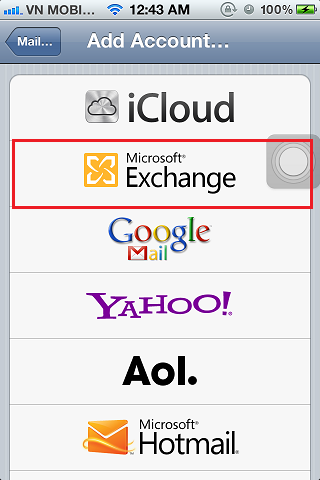 Luckily, I looked iPhone’s my friend and I recognized that he’s using Microsoft Exchange option instead Google Mail in (Settings => Mail, Contacts, Calendars => Add Account …). I’ve followed the instructions to create my Gmail account and it WORKED and completely solved the Cannot Get Mail to imap.gmail.com mail server issue. Sorry what server did you put when you made the exchange to Microsoft?